Chloe began working at the Cat Clinic of Cobb under the ownership of Dr. Patricia Lane in April 2004. 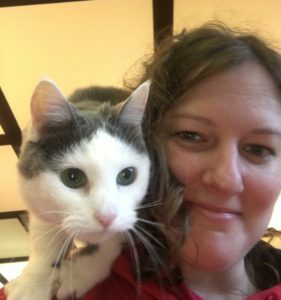 Chloe has been a Veterinary Assistant since 2004, and she has worked exclusively in feline medicine since then. Chloe has a distinct preference and passion for cats even though she cares for a multi-species household at home. She is skilled in many aspects of feline care including grooming and assists with in home grooming services with Sophisticated Mane when she is not at PWC. Additionally, Chloe has also been a feline specific pet sitter for Paws and Purrs Feline Services for the past 10 years. She is a welcomed asset and we are thrilled to have her as part of the PWC team. Chloe shares her home with her husband, Travis, 15 kitties and 5 dogs. She is also guardian of a horse, Nate.